A maritime superstition claims that any ship ending with the letter ‘A’ brings bad luck. The 19th century schooner Augusta would certainly seem to bear that out. Her sailing career was filled with so much misfortune that she was eventually renamed, although sailors also regard changing the name of a ship as bad luck. But how then to account for the doomed history of the Lady Elgin? 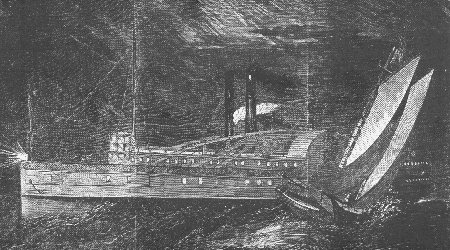 Her lake travels were as ill starred as the Augusta, and it seems tragically fitting that these two doomed ships were fated to meet in the stormy waters of Lake Michigan on September 8, 1860. Lady Elgin was a sidewheel steamer built in New York in 1851. Because her boilers and engine once powered a slave trading ship called Cleopatra, many believed she was a cursed ship from the moment of her launching. In 1854, Lady Elgin hit an uncharted reef off Manitowoc, Wisconsin while carrying hundreds of passengers. The following year, problems with the ship’s machinery led to her being towed to Chicago. Two years later, a fire caused severe damage to many of the ship’s staterooms and most of the hurricane deck. In 1858, she once again hit a reef, this time near Copper Harbor, Michigan. And she had to be towed twice in 1859 due to broken ship parts. On September 7, 1860 however the atmosphere aboard the refurbished Lady Elgin was festive. On board were 350 passengers, and 35 crew members bound for Milwaukee. Sometime between 10 and 11pm, the ship departed Chicago where most of her passengers had listened earlier that day to a presidential campaign speech by Stephen A. Douglas. As the ship steamed against heavy northeast winds, a German brass band entertained everyone on board. By 2:30 in the morning on September 8, they were approximately 16 miles north of Chicago. Many passengers were asleep in their staterooms, although accounts say that some were still dancing to the band. Outside however the sailors had to contend with heavy thunderstorms, gale force winds, and the sudden appearance of a small schooner called the Augusta. Although the Lady Elgin was brightly lit, the Augusta was dark, making her difficult to see at night in a squall. And due to the heavy winds, her speed was eleven knots per hour. A coroner’s inquest later revealed that the Augusta’s second mate had seen the lights of the passenger steamer thirty minutes before the accident, but no attempt to correct course was taken for another twenty minutes. When the Augusta finally took action, it was inexplicable and deadly. The vessel should have tried to pass Lady Elgin on her port side as was customary in such situations; instead it moved to her starboard. The Augusta hit Lady Elgin straight on, causing a great hole in the side of the ship. The collision ripped through the cabin, the hull and the guards. The powerful impact also sheared off the wheel. Almost immediately, the two ships separated. It is likely that the gale winds simply swept the Augusta off into the night before anyone was aware of the gravity of the situation. Indeed Captain Malott of the Augusta initially thought that his ship had sustained far more damage than the larger Lady Elgin. And given the pounding rain, crashing waves and darkness, visibility was negligible. What is certain is that the Augusta quickly sailed off, leaving the Lady Elgin critically damaged. Within minutes of the impact, the Lady Elgin began to list. A surviving crew member wrote that right after the collision, he walked past the cabins where he “saw the ladies, pale, motionless, and silent. There was no cry, no shriek on board – no sound of any kind but that of the escaping steam and surging waters.” Because Captain Wilson knew that his ship was only about nine miles from Winnetka, Illinois, he encouraged passengers to hold onto the 5-foot long wooden life preserver floats that were distributed. But as the ship began to roll - and lightning illuminated a lake strewn with wreckage - many simply threw themselves overboard in terror. The Lady Elgin sank in thirty minutes. There had been time to only lower two boats; 18 survivors reached shore in them. Fourteen made it to safety on a raft, and another 60 lived by floating on bits of wreckage. The drummer of the brass band survived by floating in his bass drum. Sadly, many who made it close to shore were then killed by the pounding surf and deadly undertow. Even Captain Wilson lost his life. He and forty other people spent hours drifting towards land as they clung to wreckage from the hurricane deck. So terrible were the conditions that by the time land was in sight, only eight remained alive. As they neared landfall, Captain Wilson tried to rescue a woman drowning in the breakers, but both of them died during the attempt. Out of 385 men, women and children officially on board, only 98 survived. It has been speculated that up to 700 passengers may have actually been on the ship. Bodies washed up along Lake Michigan for the next three months. Those that could not be identified were buried in a mass grave in Winnetka; other bodies were transported back to Milwaukee. Indeed the sinking of the Lady Elgin has been called “one of the greatest marine horrors on record.” And there has been no other accident on the open water of the Great Lakes that has taken so many lives. 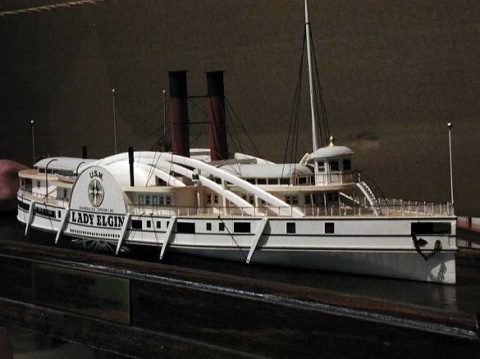 Small wonder that the Lady Elgin is regarded as "the Titanic of the Great Lakes." Meanwhile the Augusta delivered her load of lumber to Chicago, unaware of the disaster out on the lake. The Augusta’s young captain, who turned twenty-seven on the day of the accident, was subsequently arrested, but a trial acquitted him of negligence. He had only recently taken command of the Augusta, and had not yet learned that the ship was difficult to steer when carrying cargo. Instead a coroner’s jury found his second mate grossly incompetent for not informing the captain when he first sighted the other ship. If any good resulted from this maritime tragedy, it was the ruling four years later that all sailing vessels had to carry running lights. Long rumored to be a bad luck vessel, the Augusta was now seen as cursed, or what sailors term a “hoodoo” or “black cat” ship. After spending the winter in dry dock in Detroit, the Augusta set sail the following spring under a different name: the Colonel Cook. But perhaps more attention should have been paid to the superstition about not giving a ship the name of a vessel that has been lost to the lake. Three years earlier, a schooner called Colonel Cook had departed from Detroit bound for England. It never arrived, wrecking en route in the St Lawrence River. As for the newly rechristened Augusta, her owners also ordered her to be painted black. But a name change and a new paint job weren’t enough to conceal her past. When she arrived in Milwaukee with a cargo of lumber, word quickly spread that the ship that had killed so many Milwaukee citizens nine months earlier was now in the harbor. 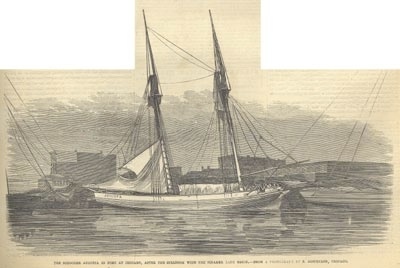 The former Augusta had to rapidly set sail before an outraged mob set fire to her. Shortly after this incident, she was sent east where she sailed for several years along the Atlantic coast. Eventually however the Colonel Cook returned to the Great Lakes. But due to her reputation as a cursed ship, it was always difficult to hire a crew. It seemed that every sailor knew how many people had died when the Augusta ripped open the Lady Elgin. Those men who did sign on as crew members told tales of seeing strange lights on the night deck, or hearing scratching sounds on the wood planking – as though people were trying to claw their way to safety. Finally on September 23, 1894, the Colonel Cook became stranded on a Lake Erie shoal, breaking apart near Euclid, Ohio. All of the crew survived. But when the former Augusta went down, it seemed to many that justice had finally been delivered by the lake itself. 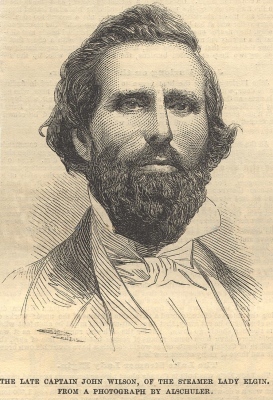 Darius Nelson Malott, captain of the Augusta on the night of the collision, did not escape the curse either. In 1864, he was hired to captain the Great Lakes vessel Mojave. 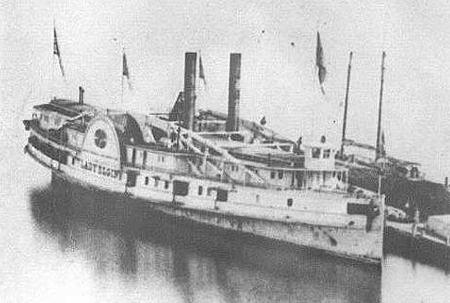 A few months later, the Mojave sank in Lake Michigan with all hands onboard – including Malott. Not only did the ship disappear close to the spot where the Lady Elgin went down, it sank on September 8, 1864. It was Captain Malott's 31st birthday -- and the fourth anniversary of the Lady Elgin disaster. History of the Great Lakes - Wreck of the Lady Elgin, Publisher, Chicago: J.H. Beers & Co., 1899, reproduced on the Michigan Family History Network. Haunted Lake Michigan , Frederick Stonehouse, 2006. Lost Passenger Steamships of Lake Michigan , Ted St. Mane, The History Press, 2010. Shipwreck, Monsters, and Mysteries of the Great Lakes (Paperback or Kindle ), Ed Butts, Tundra Books, 2010. Graveyard of the Lakes , Mark. L Thompson, Wayne State University Press, 2000.